A little Elmering will turn that confused first-timer into a Field Day fanatic. I just finished my 50th Field Day. It is as fresh now as it was then, operating on Rattlesnake Point with my Novice set dead even with the high-tide water of Corpus Christi Bay. My mentors in the Corpus Christi Amateur Radio Club set up heavy tube rigs on sturdy tables nestled in flimsy tents. We fired up large, loud generators and snaked thick extension cords and black coax across the little island of broken sea shells. We talked all across the nation and Canada all weekend to the cries of sea gulls and the tooting horns of shrimp boats passing by at dawn on Sunday morning. I was hooked. As the weekend drew nearer back then, I remember becoming more apprehensive. Field Day, although an incredibly fun weekend, can be a little scary as well. I would be operating with the older guys who already had DX Century Club (DXCC), Worked All States (WAS), Worked all Continents (WAC), Brass Pounders League (BPL) and Rag Chewers Club (RCC) awards on the wall. The guys who could carry on a conversation on CW or SSB without hesitation, stammering or saying “Uhhh” about every fifth word. The guys who could pass traffic and break pileups with equal ease. They knew how to fix equipment and build antennas, from scratch, in 15 minutes then work the world with them. They had worked as net control operators in severe domestic and international emergencies, been recognized by the ARRL® and written up in QST®. Here I was, a 14 year old Novice with barely 3 months of experience, having to set up and operate my little inverted V, Heathkit DX-20 transmitter (with one crystal) and Hallicrafters S-85 receiver in front of them in the middle of the Field Day chaos. I was not exactly filled with confidence. Somehow, I made it through, with a lot of help, advice and ribbing from “the guys.” Oh, and did I say encouragement as well? In 2011, I introduced Field Day to two excited local hams. The party had started and stations filled the air. Each guest operator seemed a bit hesitant to hit the microphone or pound the key. “There’s a CQ,” I would point out repeatedly or tell them, “Call CQ, there’s an open frequency.” Though they would hunch forward toward the key or microphone each time, they wouldn’t transmit. Other times they would start transmitting and then stop before completing a call. I called a time-out to discuss what was happening. Their first problem was that almost all they could hear was noise. Second, not being familiar with the Field Day exchange, they did not know what to send or understand what the other station was sending. To help them make successful Field Day contacts, I needed to address these two concerns. I also drew a broader conclusion: They were feeling exactly the same feelings I had experienced on my first Field Day. Due mainly to a lack of knowledge and limited experience, they felt a little fear perhaps, a bit of embarrassment maybe and real confusion. These were enhanced by a genuine, powerful, gut-based desire to join the fray. The latter made them grab the microphone or key; the former stopped them from starting or completing contacts. They really wanted to join in but they just did not know how. From our conversation and my memories of my first Field Day, I realized that there must be thousands of new hams who feel the same apprehension yet have the same strong desire to participate in Field Day. As a result, I quickly created the training activity described below. It seemed to resolve their concerns since they both started enthusiastically making contacts that afternoon and continued operating into the night. One operator sent me a nice thank you note telling of his new-found joy at making contacts and improving his CW operating skills. The other operator said the experience was a topic of lively conversation with friends the next day. The confidence these two hams achieved in a few short hours suggest that this basic training might help others have a successful Field Day. To start with, I explained that, yes, there was noise — and lots of it — but within the noise were signals. When there are many signals on the air at the same time, as in Field Day, the signals, too, could sound like noise. I explained that the nonrandom noises were signals and had them listen for the differences between the actual noise and the CW and SSB signals. Next, I corrected a bit of receiver mistuning explaining that signals needed to be placed within the filter’s passband to come in clearly. We briefly discussed what filters were, how the passband was shaped and how to use it. I reminded them that detailed information and graphics showing how to place a signal in a passband were in The ARRL Handbook and in many equipment operator manuals. After a number of minutes, they were able to tune and pick out specific signals from the overall noise and peak those signals within the passband. They began to hear the words and CW tones much more clearly but still didn’t understand what the messages were. Their second concern was not knowing what they were listening to or how to respond to the station who answered their call. That led to a certain amount of hesitation in calling or responding to stations. What they heard seemed to be gibberish. 1. Call the CQing station — After completing a contact, the other station will either call CQ again, say “QRZ” or “Field Day.” He is asking for another station to call him. I pointed out to both hams that it might as well be you. Send your call just once. Use the standard phonetic alphabet on SSB when calling the station. 2. Receive the station’s acknowledgment — if the other station hears you, he will reply with your call. If he can read you but doesn’t quite understand your call, he will reply with whatever part of your call he copied. Using the call W5ABC as an example, on CW he may send the letter “A” or the letters “AB” or even simply a “W5.” A question mark could follow any of these responses, depending on the operator’s style and band conditions. In these cases, if he is answering you, send your call once again immediately when he stops sending. In poor conditions, the other station may repeat his request several times till he has your complete call, which he will send back to you. The information required by Field Day rules will follow. Get ready to listen for it. On SSB, exactly the same thing occurs but with a little more plain language such as “the letter A, please” or “the Alfa Bravo?” or “who’s the Whiskey 5?” Don’t get flustered or mixed up by the partial reference. Simply respond with your whole call once again in standard phonetics and be ready for his message, as in a CW contact. 3. Receive the station’s message — Field Day has its own requirements for the exchange between stations. The required exchange is your station’s operating class, such as “25A” or “1B” and your section or province such as “STX” on CW or “South Texas” on SSB. Stations outside the United States or Canada will send “DX” as their section. Exchanging your two pieces of information with his two pieces makes a valid Field Day contact. The Field Day Packet (www.arrl.org/field-day) explains what the numbers and letters of the various operating classes mean and provides a list of abbreviations for each section and province. So, listen for the number-letter combination of the station’s class followed by the abbreviation designating his section. If you didn’t quite get all the information, it’s time for you to ask for a repeat (known as a “fill”) of what’s missing. That’s all there it is to it. After you copy it correctly and fully, get ready to send your information. 4. Transmit your message — When the other station sends her exchange and pauses, it is time for you to send your information back to her, so send it without hesitation. After you transmit, she may ask for fills. For example, on CW she may ask for a repeat of your section by sending “sec?” or for your operating class by sending “class?” or “cl?,” which stands for “class.” On SSB, she will just ask you for it in words. In the crowded, fast pace of Field Day contacts, it is no shame to ask for fills more than once on either side. Remember, a valid contact in any major operating activity, including Field Day, is a full and complete exchange of required information between two stations. That’s the rule, so do not be afraid to ask for fills yourself. Otherwise, both your efforts are wasted. Only stop asking when you get his information or when he calls someone else — sometimes the band changes and he loses your signal at his location. He might also think it’s time to move on and make other contacts that are easier and quicker to complete. Sometimes the time and effort spent in trying to complete a partial contact simply aren’t worth the benefit. If so, just let it go and move on the next station. No harm was intended if the other station moves on. In reality, in a major contest or noncontest activity like Field Day, stations do compile scores based primarily on the number of contacts made in a given amount of time. In Field Day, it’s not the score itself that matters. More importantly, the score represents a personal measure of how effective and efficient you and your station are in an emergency or adverse situation. Take solace in the fact that you both did your best at the time. Try not to be disappointed too long if the station finally goes on to someone else. After all, he wanted your contact in his log as much as you wanted his. It’s no personal slight to you that the contact is incomplete. Instead, it should be a motivator to improve your operating habits and station capabilities for that emergency we hope never comes. Besides, the band may change in your favor later on and you can try again. 5. Receive the station’s acknowledgment — When the other station receives your full information, he will acknowledge it by sending an “R,” “X,” “QSL” or “TU” on CW or saying the voice equivalent on SSB. That means the contact is complete. It’s over. Log it and move on. Nothing further needs to be done except to give yourself a quick little pat on the back. Occasionally, the other station might not acknowledge. He may say nothing and just resume calling CQ or answer another station. I call that “acknowledgement by default” with the default being that if he doesn’t come back to you for more information, then he has got it all. It has come to be an acceptable practice more often than not, so don’t be alarmed if the other station doesn’t give you a fond farewell. You get a better sense of when “acknowledgement by default” happens as you gain operating experience. Just wait a second and if he resumes operating with someone else or calls CQ, you’re done. If he is not finished, believe me, he will let you know and continue to work with you until the contact is complete. One variation in acknowledgement that confuses newer operators is to copy “NIL” on CW or hear “NO QSO” on SSB. “NIL” means “Not In Log.” The other station is saying he tried his best but couldn’t quite copy your full information and, therefore, will not include the contact in his log. If he says that, you cannot claim the partial contact as a valid contact either. When you hear either of these two responses, try again later when conditions may be better. View “NIL” or “NO QSO” as a courtesy to you, not as a rude remark, since it helps improve the accuracy of your log and lets you both move on to other contacts. Rules are getting stricter regarding logging errors, with some organizations penalizing operators for submitting logs with large numbers of such errors. You don’t want to find yourself in that situation. 6. End the Contact — Sometimes you will hear the station you just worked say “73” or “GL” (for good luck) or “Good luck and thank you from W….” The practice is more frequent now with programmable keyers and automatic voice devices. You may be tempted to respond the same way. Some view it as being courteous while others feel it just takes up time in which another station could make a call or contact. So if you feel the need to send one last thing, keep it short. The other station and those waiting to work him appreciate the brevity. Being brief also allows you to move on more quickly and work someone else. After explaining Field Day exchanges, I demonstrated, in real time, the exchange with several Field Day stations, both on CW and SSB. The two hams began to understand when and what was being said. After only a few minutes, they didn’t need my prompting and assistance in copying Field Day exchanges. Then I had them tune around on their own, place signals in the receiver filter passband properly and copy messages through the clamor. As a last exercise, they operated independently and started making and logging contacts for themselves. I helped only when a station was talking or sending too fast or slipping away in a deep fade. In summary, I was very pleased with the process and with the skills and confidence these two hams demonstrated following the training session. I enjoyed seeing them both quickly become enthusiastic and even competitive on the air. Other clubs and individuals may wish to use similar exercises to train their newer operators so that they too can make successful Field Day contacts in the midst of all that beautiful “noise.” They might even get hooked on it, as I did, and join the fray with you for years to come. 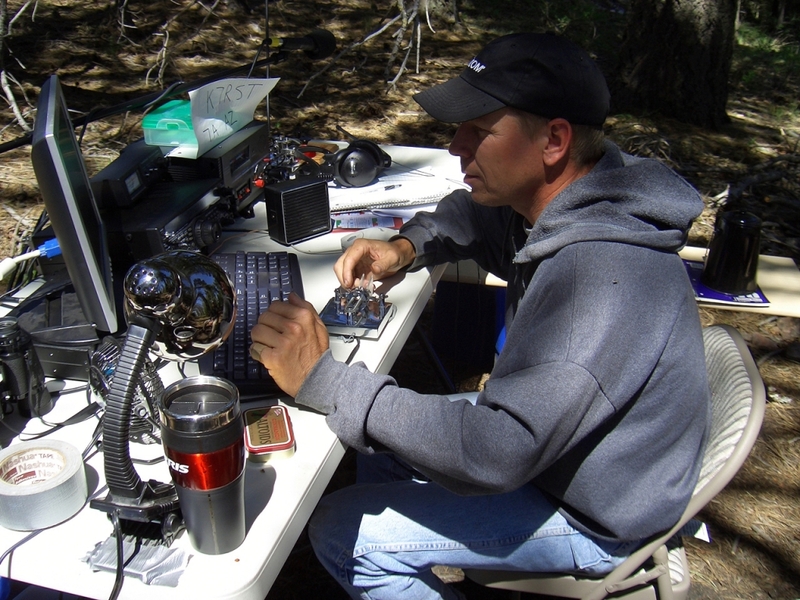 Robert S. Logan, NZ5A, an ARRL member, is an Amateur Extra class operator. He was first licensed in 1962 as WN5CIY while in Texas obtaining NZ5A in 1979. He holds BS and MLS degrees from the University of Texas at Austin. Robert retired from the City of Austin in 2010 as a contract management manager for the local electric utility. His interests include homebrewing, restoring vintage radios, low-power contesting and designing and building HF wire antennas. He has published a textbook on training and education systems, numerous technical reports and several articles related to various facets of Amateur Radio. He is presently enjoying retirement in the country with his wife and has three children and three grandchildren. He can be contacted at 8712 Lone Tree Dr, Namor, TX 78653, bob.logan47@yahoo.com.